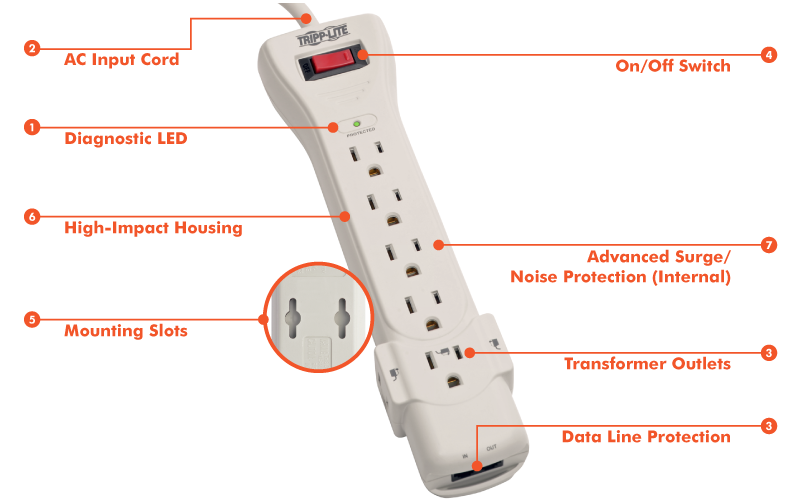 Tripp Lite's SUPER6TEL12 surge suppressor offers complete AC and phone line surge suppression for comprehensive protection of workstations, desktop PCs, telecom systems and other sensitive electronics. High-grade AC surge suppression shields connected equipment from damage and performance problems due to transient surges. Set of RJ11 telephone line suppression jacks protect dialup and DSL modem lines, fax machines, cordless phones and more. SUPER6TEL12 offers 7 total outlets, 3.66 m (12-ft.) cord with a space-saving right-angle plug and diagnostic LEDs to warn of wiring problems and suppressor damage. Heavy grade AC suppression rated at 1080 joules shields equipment from surges and line noise. Attractive white suppressor housing with keyhole mounting tabs and 3 designated transformer plug outlets offers convenient protection of desktop computer equipment and accessories. This surge protector is perfect for home and office electronics of all kinds, including computers, monitors, printers, wireless routers, televisions, video game consoles, streaming media players, sound systems, device chargers, DVRs, fax machines, broadband modems, desk lamps and small appliances.